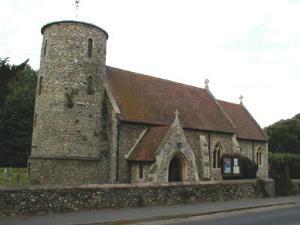 The round tower of St Mary’s Church is Saxon, and around 950 years old. It has a triangular headed doorway on the first stage above the tower arch inside the church, and is constructed with some large puddingstone material near the base inside. The walls are flint. The saxon belfry windows are constructed with flat flints set to make a round topped opening. The tower is capped with a lead roof and a weather vane. At one time it had a tiled roof. The base of the tower is six inches thicker up to a height of ten feet. The coursing of the flints does not have the appearance of saxon work; it may have been extensively restored, or even an outer skin of flints added. In 1797 The north aisle and south porch were demolished, the east window was opened and the floor of the chancel was raised. New seats were added and windows repaired at the same time. In 1855 and 1898 further restoration took place. The north aisle was rebuilt complete with new arcading, and the present south porch and vestry were built. The present pews were also installed in 1898. Under the centre aisle is an iron grating covering a deep pit for a coke furnace which provided effective heating. Fine headstops on the outside of the nave south windows are a feature of the Victorian restoration. Now so much restored the south wall and the west wall of this church probably still comprise some of the original saxon walls which were built at the same time as the round tower. Inside the tower, the floor is paved with an interesting assortment of tiles. A child’s stone coffin lid, three feet long, bears a simple cross and shaft. The bell is a particularly early one, made in King’s Lynn by M Derby in the 14th century. The chancel arch is perpendicular period. The wrought iron screen and the modern rood were added in 1932. Under the crucifix is a circle in iron with HIS, the latin symbol for ‘Jesus Saviour of Men’. St Mary and St John stand on either side. The Norman font once stood in the north aisle, but in 1797 it was broken on being moved, and taken to Fincham Rectory for repair. It stayed in the garden there for some forty years before it was finally restored and returned. The font is made from Barnack stone from Rutlandshire, and depicts the farming year from a working man’s point of view, read from right to left, starting on the north face. In some panels the name of the month is inscribed in Latin, e.g. Februarius. The west window on the north aisle is 15th century glass and has a perfect emblem of the Holy Trinity. The chancel south windows of 1853 are made of thick moulded glass with conventional leaf designs. This was a very early form of Victorian glazing. Reproduced from Church Notes with kind permission.